Join us for another FABULOUS afternoon of drag and dogs! Maricopa County Animal Care and Control along with Kobalt, Arizona Animal Rescue Mission (AARM) and Doggy Daze invite you to come out for a suggested donation adoption event! 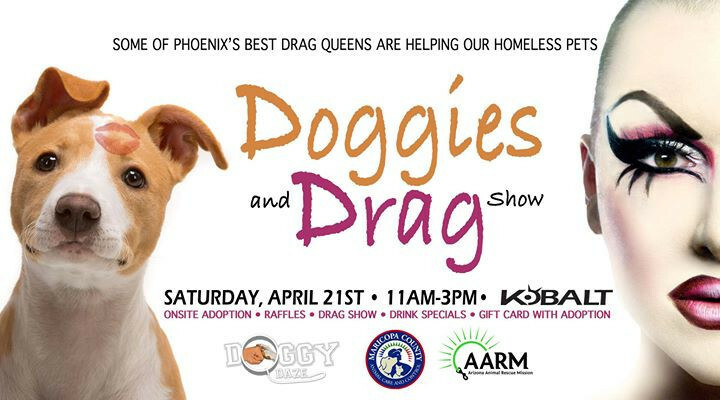 Join us for a drag show, where our adoptable four-legged friends will be dolled up by your favorite queen. Raffle and prizes! If you canât adoptâ¦DONATE! Puppy pads, newspaper, food or CASH! All going to help out our furry friends! Age 21 and over.